I went hunting for all my red lipsticks today. I have always kept a nice supply of red lipstick ready for those evenings when I am feeling daring and in the need of one dramatic stroke. But if there is one thing I noticed this week, we are going to be reaching for the red lipstick this winter. It seems to be the Pucker Up colour of choice this season. I couldn't be happier, I love wearing red lipstick, it makes me feel quite daring, yet polished in a one-stroke way. This fabulous illustration from here. While I was writing this post, up came an email from Kate Spade well not her directly or anything and there it was............red lipstick. Supercalifragilipstick in red, as in Kate Spade New York now sells lipstick. Even though I have deliberately downplayed my make-up recently into a more age-appropriate palette of more neutral shades and lighter application, all bets are off when it comes to red lipstick. While I was looking at this ad the top right corner to be specific, it reminded me of two entertainment/Fashion critics talking about the pink-and-red Monique Lhuillier gown that Zooey Deschanel wore to the Emmy's this past week. The two male critics were really dissing the red-pink colour (it's actually a coral ribbon) combination which stuck me as kind of odd especially these days when every conceivable colour, pattern and style goes together and considering she is what 20? I admit it isn't a conventional combination but then Zooey isn't know for being conventional and that seems to have worked out pretty good for her. I thought it suited her youthful personality, and isn't that the point? 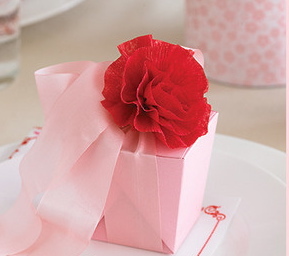 Everyone well women anyways know red and pink go together and not just in fashion.........gift wrapping too. Wouldn't the Kate Spade lipsticks make for a wonderful stocking stuffer? 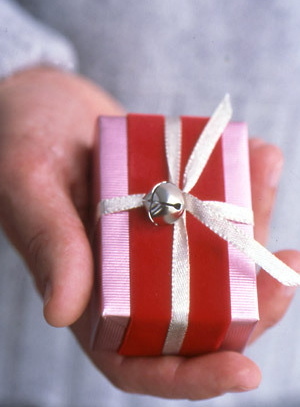 The perfect gift wrapping palette for a fashion gift. Really, the holiday season is not that far away. Tell me.........are you going to wear red lipstick this season? I love your combos of pink and red... one of my favorite combos! I adore my reds! This is one to check out! 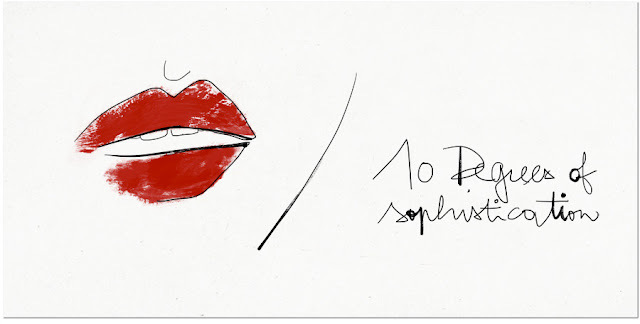 Do you remember the Paloma Picasso red lipstick? Miss that one! I wear red lipstick every day of my life and have for 31 years! If I switch to a lighter shade everyone asks me if I'm sick! Glad to see it is back in fashion..but then again I don't go with the fashion trends. Those lipsticks look gorgeous! Red lips here we come! I've done it before and I'll do it again! Probably not. Mostly because I haven't found my perfect shade yet, and also, I prefer more natural looking lips, since I tend to work more on my eye make up instead. But I absolutely love this look on others!! I'm one who can't wear red but CAN wear fuchsia ... with aplomb! Red makes me look ewwww! But bright fuchsia makes me look sooooooooo ... me. Alive. But go girl to all those who can rock the red. 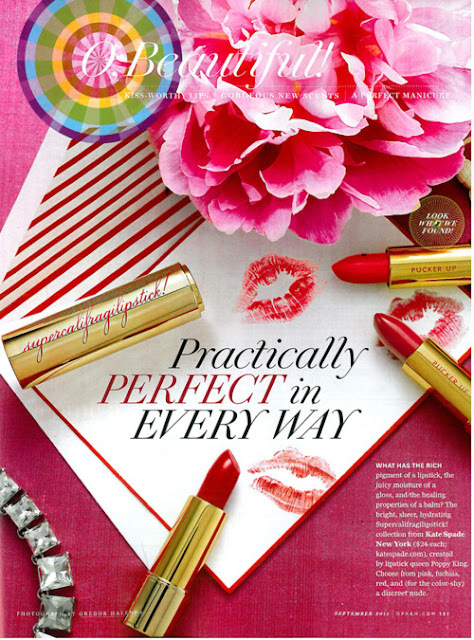 Oooh, Kate Spade lipstick as a gift is a GREAT idea. I personally like Zooey's dress and ribbon around the waist, and agree that she above many other actresses can get away with artsy creative clothing. I like red lipstick, but I'm a bit shy with it since I live in a rural community. People around here associate bold makeup with "prostitutes." I definitely don't want to be viewed in that light! However, I do like reds with hints of gold or pink. If I were in a big city like Paris or New York, I would wear red lipstick every day just because I could! I have just ordered my Supercalifragilipstick in Adventurous Red! Like you, I've toned down my make up to be more in keeping with my age, but I miss the fun of make up. Adding red lips to this toned down palette feels like just the right touch!